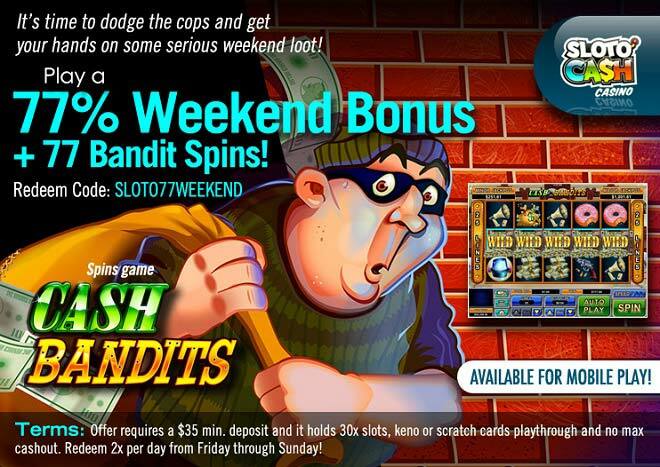 Dodge the Cops and Collect a 77% Summer Weekend Bonus + 77 Bandit Spins! How will you make your summer unforgettable? How about embracing new thrills such as getting away from the cops with a 77% Weekend Match plus 77 Free Cash Bandit Spins! If you’re craving summer adventure then you better buckle up as you’re going against the cops on the weekend in Cash Bandits! Spin the 5 reels of this entertaining slot where you’ll find a vault full of wins, free spins, wild vaults, scatters and bonus round features! If you’re yearning to try new and exciting things this summer, then take a wild ride when you deposit as little as $35 to get away with loot, a 77% Weekend Match plus 77 Free Bandit Spins!